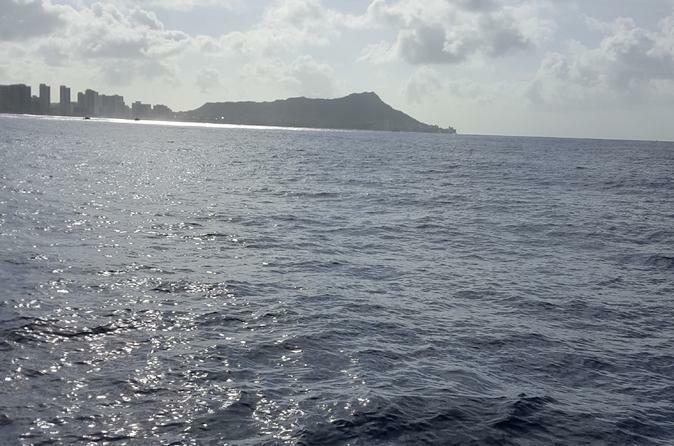 Vá observar baleias na costa de Oahu nesta excursão de Waikiki ou Ko Olina. Durante os meses de dezembro a maio, vagens de baleias jubarte migram pelas águas mornas do Havaí, e esse passeio garante avistamentos de baleias. 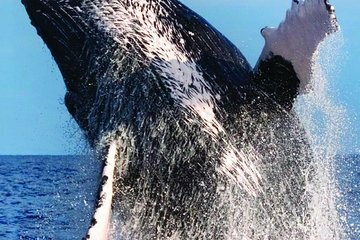 Com um pequeno grupo de pessoas, observe os gigantes gentis nadando, alimentando-se, quebrando-se e brincando com seu barco. No caso raro de você não ver nenhuma baleia, você poderá fazer o passeio novamente de graça. Snacks e transporte de ida e volta a partir de hotéis de Waikiki estão incluídos. O barco pode caber 40+, mas o passeio é limitado a 24 pessoas, o que significa que há muito espaço para passear por vistas panorâmicas. Após o embarque no seu hotel Ko Olina ou Waikiki, traslado para o Porto de Waianae ou para o Porto de Kewalo Basin, respectivamente, para conhecer seu barco. Traga sua própria comida na excursão ou desfrute de lanches e bebidas não-alcoólicas a bordo. Este passeio funciona em todas as condições meteorológicas, portanto, vista-se de acordo. Embarque em um barco monocasco ou catamarã com seu pequeno grupo de turismo e conheça seu simpático capitão e tripulação, que têm milhares de horas de observação de baleias em seus cintos. Ouça como eles compartilham seus conhecimentos sobre essa majestosa espécie e sinta-se à vontade para fazer qualquer pergunta. Os gigantes gentis chegam ao Havaí em dezembro e passam tempo espirrando, rompendo, alimentando-se e nadando na água quente havaiana. Fique atento a bofetadas de rabo, brechas e jatos de água nos buracos da baleia. No caso improvável de você não ver nenhuma baleia, você pode voltar para uma viagem gratuita e tentar novamente. Depois de 2 a 3 horas, retorne ao porto e aproveite o transporte de volta para o seu hotel Ko Olina ou Waikiki para o desembarque. We were only on the water for 2 hours. We did see 3 whales but not long enough to take a picture. Not much commentary. We got lucky and found whales just outside the harbor. The captain and crew were great, making sure we had drinks and snacks. They even offered to take pictures of us with Waikiki in the background. Had an absolutely fantastic time watching the whales and even some dolphins. We didn't see any whales. Saw more on the cruise. Would not spend money for this tour. Staff was great! Good time on the boat. Saw quite a few whales. Staff was awesome!! This was a last minute booking and I am glad I did, we barely saw the humpback whales they were in the distance, but being on the water was fun. The captain was great! Many thanks to the crew that took us out , they were totally professional and very friendly. The catermaran was well suited and equipped with a bar and snacks ,it was not crowded so there was plenty of room and we were allowed to move about above and below deck. We headed out to sea but didn't see any whales then as we headed back we saw 2 water spouts indicating that there were whales just below the surface, the skipper headed back out towards them and yes we saw 2 small young whales break surface , what an amazing experience it was, we enjoyed it so much. We recommend this tour to anyone and we will be back next year!! Thanks again. We had an amazing experience watching a mother and baby humpback whales surfacing and jumping. The boat stopped and stayed its distance, but the whales came toward us and gave us quite a show. The staff was very friendly and professional. We recommend this outing. We did see whales! We motored out of the harbour for 5 minutes saw 3 whales on the surface a little way off and motored towards them and they dived before we could get close. They we stayed in the same spot for an hour waiting for them to surface which they did for a couple of minutes. The worst thing was just staying still when we could have cruised along the coast line a bit a perhaps seen some more further on. Other boats doing the whale watching were doing this not just staying still. The crew seemed more intent on serving drinks than anything else. They gave us a talk for about 2 minutes about the whales. The boat was tatty. A lot of money for not much enjoyment! The crew were all very polite and cheery but I am afraid that didnt make up for everything else! The whales did not sow up, but the crew was great.